US Speedskating has selected the Pettit National Ice Center in Milwaukee, Wisconsin, as the site for the 2018 U.S. Olympic Team Trials – Long Track Speedskating. The team trials will take place on January 2-7, 2018, and will determine the U.S. Olympic Long Track Speedskating Team. The state of Wisconsin has a rich history in speed skating and we’re excited about adding to that legacy. A total of 34 Olympic medals have been won by speed skaters born and raised in Wisconsin. Opened on December 31, 1992, the Pettit National Ice Center has been proud to be an Official U.S. Olympic Training Site for speed skating in the country. At the same time, the Center is an extraordinary community asset, hosting more than 425,000 visitors annually for ice skating, figure skating, hockey, learn to skate, its 445-meter run/walk track, along with other healthy activities. 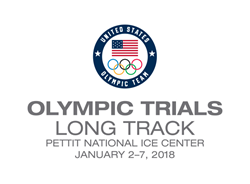 The 2018 U.S. Olympic Team Trials – Long Track Speedskating will be used to determine members of the U.S. Olympic Team. Up to 20 athletes may be named to the Olympic Team – 10 men and 10 ladies – across 12 individual distances and two team events. All nominations to the U.S. Olympic Team are subject to approval by the United States Olympic Committee. The Olympic Winter Games PyeongChang 2018 will be held in South Korea, from February 9-25, 2018. Both Long and Short Track will be held in the Gangneung coastal cluster with all Olympic competitions for Long Track Speedskating to be held at the Gangneung Oval, host of the 2017 World Single Distance Championships that saw Team USA win the second-most medals of any country. Tickets sales and event information for the 2018 U.S. Olympic Team Trials will be announced at a later time. From Pond to Podium, we are US Speedskating. We grow and nurture a sport where all ages can experience the thrill of speed and the camaraderie of the skating community. US Speedskating is responsible for the development of speed skating from grassroots to the highest elite racing programs. US Speedskating is recognized by the United States Olympic Committee and the International Skating Union as the governing body for the sport of speed skating in the United States. The Organization has won 86 Olympic medals to-date, making it one of the most successful sports in U.S. Olympic history. US Speedskating is a 501(c)3 non-profit organization. Follow us on Twitter, Instagram, on Facebook and at http://www.usspeedskating.org. The Pettit National Ice Center is a 501(c) 3 nonprofit organization that supports the development and health benefits of skating among people of all ages and abilities. The Pettit Center actively promotes to the general public, young and old, the mental and physical rewards of recreational skating. As one of only two indoor Speedskating Ovals in the United States, the Center also helps prepare amateur athletes for local, regional, national and international competition in speed skating.